Which ‘style do you like best? The B&W or the color? I’m experimenting. The cartoon will be published for tomorrow and I still have not decided which I like best. Hello world! How’s the family? I have been doing “IT Rules” for a while. Once I get my old toons moved I’ll start doing some new themed toons. I have several ideas to do, but it’ll be a work in process for a while. Still trying to work out some custome parts of the page. Plus I have only moved 2 cartoons so far. Looking for an easier way than doing a post per toon. UPDATE: I have moved all of the cartoon archive over now. I have even added a couple of new ones. We’re not sure what to buy him for Father’s Day, but it should have blinking lights and lots of memory. This server upgrade makes me nervous. 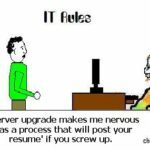 It has a process that will post your resume if you screw up.